Draw 4 different sketches for eyes showing symmetry and originality. Select and combine a variety of materials to create a unique screen mask. Name the Mardi Gras colors and what they represent. Describe the Mardi Gras run. Explain what Mardi Gras is. Explain the difference between a violin and a fiddle. locate the medieval period on the art timeline. Decide if the people in the book consider their masks to be art. Name a variety of masks and categorize them as functional, decorative or ceremonial. Classic Mardi Gras Parade & Float Films DVD - This is a compilation of amateur film captured from Mardi Gras in 1941, during the WWII era. Included is approximately 10 minutes of rare footage from the Parade of Nor and approximately 10 minutes of footage from the Parade of Krewe of Rex. The Ultimate Guide to New Orleans Mardi Gras - Co-hosts Shane Jacobson and Ashley Arcrement celebrate Mardi Gras' quirks and idiosyncrasies as its inhabitants recover from the devastation of Hurricane Katrina, determined to keep the 150 year Mardi Gras tradition alive. 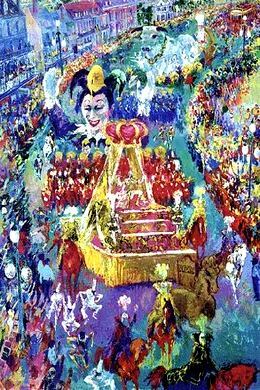 The hosts ride on a float in the parade, attend several Mardi Gras Balls and visit Bourbon Street and the Bourbon Street awards. Assorted trims, rick rack, pom poms, fringe etc. This lesson will begin with the teacher reading the book, Mardi Gras: A Cajun Country Celebration as the motivational activity. Students are encouraged to go home and beg (ask nicely) their parents to buy them 1 package of double folded bias tape while explaining the begging ritual and this project. This lesson works well for me because I begin the 3rd grade school year with a stained glass window project from the Gothic Period. The first lesson of the year teaches my students about the timeline. This lesson gives them another opportunity to use their timeline skills. Open the classroom door wearing a screen mask and wearing a capuchon. Have Cajun music playing. Explain to the students that today they will learn about a new holiday celebration called Mardi Gras. Ask the students to name holidays that they celebrate. Have a student locate Louisiana on the map. Locate the medieval period on the timeline. Allow time for questions and discussion of the book. Demonstrate how to fold a piece of 9x12 manila paper to make 4 sections. Demonstrate sketching different eye designs in each section. Eyes should be symmetrical, unique and have 2 finger widths between them. Tell the students that they will emphasize the eyes on their mask, making them the most important (outstanding) part. Enlarge eyes slightly to create emphasis. Have students repeat demonstrated steps, folding paper and sketching eye designs. Have students select their favorite and best eye design they wish to use for their mask project. Outline it with black crayon and color it with crayons. Eyes may be unusual colors. Close lesson with a few questions about what was learned about Courir de Mardi Gras. Students are encouraged to go home and beg (ask nicely) their parents to buy them 1 package of extra wide double folded bias tape and rick rack while explaining the begging ritual and this project. Begin with a quick review of the project by asking questions. Demonstrate how to cut bias tape to fit the sides of the screen. Demonstrate how to glue bias tape on each side. Be sure to push the screen all the way into the fold. Press the bias tape down on the screen and hold in place until the glue begins to set. Trim off any excess bias tape. Have students select bias tape and complete the demonstrated steps. When students have finished gluing bias tape on screen, demonstrate how to locate the middle of the screen in order to line up facial features so that they will be symmetrical. Have students place the screen over their best eye design and trace the shapes with a Sharpie black marker. Color in the shapes of the eye design with Cray-Pas . Outline eyes with slick paint. Finish lesson with clean-up and close by sharing with each other how their masks look so far. Begin lesson by reviewing vocabulary with questions. Demonstrate how to glue fringe onto the bottom edge of the mask. Demonstrate how to select and glue decorative trim on all four sides of the mask. Have students complete the demonstrated steps. Attach elastic band or strings to the sides of the mask. Introduce and sing the Mardi Gras Song. Draw 4 different sketches for eyes showing symmetry and originality. Did the student draw 4 different eye sketches with the following criteria: symmetry, originality, large shapes and color the best one? Select and combine a variety of materials to create a unique screen mask. Did the student create a mask with the following criteria: craftsmanship, originality, and several types of media? Name the Mardi Gras colors and what they represent. Did the student name the Mardi Gras colors and what they represent on the worksheet? Describe the Mardi Gras run. Did the student describe the Mardi Gras run through discussion and journal entries? Explain what Mardi Gras is. Did the student explain what Mardi Gras is through discussion and journal entries? Explain the difference between a violin and a fiddle. Did the student explain the difference between a violin and a fiddle through discussion and worksheet answers? Locate the medieval period on the art timeline. Was the student able to locate the medieval period on the art timeline? Discuss and assess their screen masks using a rubric with specific criteria Did the student complete the rubric assessment instrument? Define vocabulary used during this project Did the student complete the worksheet? Describe their mask within the context of the new vocabulary they have learned. Did the student describe their mask within the context of the new vocabulary by writing about it? Decide if the people in the book consider their masks to be art. Did the students discuss and decide if the country Cajun people in the book we read consider their masks to be art? Why or why not? Name a variety of masks and categorize them as functional, decorative or ceremonial. Were the students able to categorize a group of mask pictures as functional, decorative or ceremonial? Teach students dance steps to go with "Kidd Jordan's Second Line." Have the students parade through school doing the jazz walk wearing their masks. Have students beg their parents for the ingredients to make a gumbo. Make a capuchon, the tall pointed hat worn by people during Mardi Gras. Make scepters and crowns. Select a King Rex. Have a Mardi Gras costume ball. Research and write reports about Louisiana. Learn to play the "spoons."